Average Transit Share of motorized world travel in 46 world cities by region. As one can see cities with richer living experience have a higher transit-ridership. The United States with its suburban sprawl-planning leads the world in emission of greenhouse gases. Graph from the research done by Peter Newman and Jefferey Kenworthy found in the book “Sustainability and Cities” 1999. While the 3-Ds of transit-oriented-design[ii] -density, distance and design- are important, these characteristics cannot become the main focus because the principal intention of transit-oriented-development is not to create only a particular physical form but to create places that function in a unique way to capitalize on a functional integration of land use and transit. When choices are provided through design they can lead to desired usage, for instance more pedestrian friendly access and lesser car dependency. But the connections and functional sequence of movement and use should be carefully integrated in the planning. The checklist of physical characteristics is only one of the means to achieve the end benefits of intended social, environmental and economic well-being, not the end in itself. At the end of the day, the design has to embrace both the intangible spirit of the ‘sense of place’ and the concrete manifestation that allows for the sequence of events. The measure of success for a transit-oriented-design project should be site and location specific. Just as based on demographics and socio-cultural trends, the results of a transit-oriented-design will vary greatly from city to city, so will it vary from metropolitan area to suburban area. One cannot expect the same results of a transit-oriented project in Singapore, Tokyo, Zurich, Stockholm, Sydney and Portland; nor on comparing Vancouver, San Diego, Montreal, Dallas and Chicago. Focusing on quantifiable functional outcomes accounts for both different degrees of success and the uniqueness of individual spaces. When theoretical TOD models were made, some parameters such as the 10 minute maximum walking distance (from the transit stop) and inclusion of community open green spaces is universally common across cultures and countries as they relate to a common ‘human’ need. 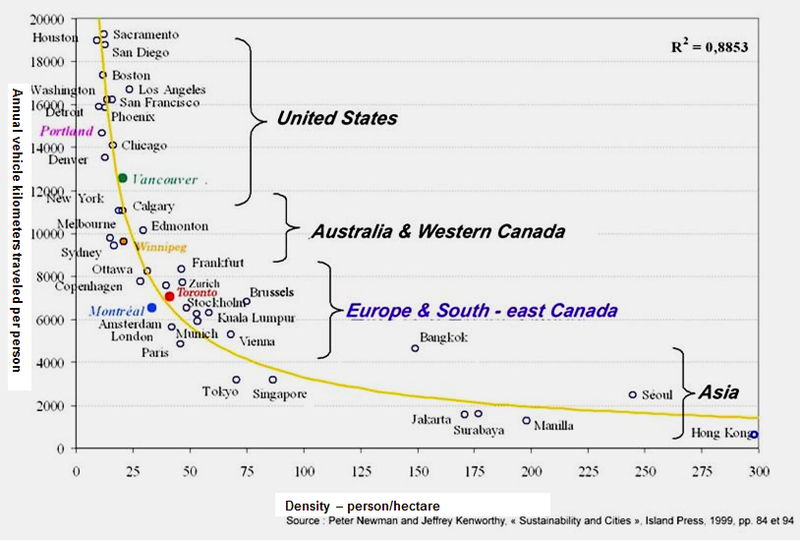 But car ownership, population density, lifestyle preferences differ greatly from city to city. In fact the danger of losing the uniqueness of a city lies more when the placeless 70s style American residential suburbs are seen as an ideal model of progress by other countries who yearn to mimic the ‘American dream’ based on media images rather than knowing the true story behind it. Similarly the transit-oriented-design model has to reflect the uniqueness of the city, not just that of its American counterpart. Most written guidelines are suited more for the American psyche. People in Asia adopting transit-oriented-design models need little convincing for living in vibrant, higher density neighbourhoods – mixed use development is a common way of life. In Europe too, lively mixed use neighbourhoods are a more desirable scenario than low density ‘boring’ places, although many ‘sterile’[iii] new towns also exist. The readiness to live in condominiums and apartments is way stronger in Montreal than would be in say, Dallas where a suburban transit-oriented-neighbourhood would aim at providing more single unit dwellings. The Building Division, Queensland Department of Public Works for instance proposes a TOD model based quite closely to the American counterpart but makes changes to suit the Australian living preference, with its lower population – even including provision of some cul-de-sacs for families with children- this being a discouraged circulation system in the American TOD models. Transit-oriented design guidelines for the 21st century have begun considering the location specific aspect and not just adopt a given physical model which has hitherto largely been the case, and the reason why many transit-oriented-design projects could not reach their full potential. Just as a project can be judged as a more or less successful TOD, two projects with the same functional outcomes in very different locations can be appraised within the context of those places. Many of the environmental, infrastructural, health benefits highlighted by the transit-oriented-design concept are those that landscape architecture theory has always emphasized on. Yet the holistic nature of this field and the interwoven connections between different systems that this profession so easily recognizes is not credited for in the transit-oriented-design writings. Interestingly, most books on this subject have been written by either architects who tried to combine ‘landscape’ into their design or by urban planners specializing in transport and economics. The contribution of landscape architecture has to go beyond ‘landscaping’ and more into community master planning. In many of the projects little is spoken about conservation, restoration and enhancement of existing site vegetation. Were these features capitalized upon or were they bull-dozed to lay out the plans? Elizabeth Meyer in her essay : ‘The expanded field of landscape architecture’ laments that the description of landscape in many modern architectural history moves from the two extreme’s of ‘wild’ and ‘distorted’ to ‘mute’ and as a ‘backdrop.’ Architecture is seen as the positive object and nature as its opposition. She has also critiqued – and rightly so – the new urbanism planners Duany and Plater-Zyberk, who described the site of one of their exhibited projects using words such as ‘distorted’, ‘radical discontinuities’ and ‘awkward’ to describe the adjacent wetlands, a river and its flood plains and land forms. While their proposed grid of blocks and streets indicated formal order, the landscape was seen as wild, unstructured negative space. Her emphasis on avoiding simplistic thinking and ideological biases of binary thinking and instead thinking in terms of continuums or hybrids goes well with the all-inclusive multi-disciplinary aspect that should determine the successful interconnections of a an ecological transit neighbourhood. The overlay of systems as well as designing with the existing features and connections instead of placing a seemingly ‘ordered’ layout still has a long distance to go. We have to remember the legacy of Frederick Law Olmstead – the uniquely versatile founder of American landscape architecture – whose concept for neighbourhood community plans was not unlike a predecessor of an ‘ecological transit-oriented-design’- and the contributions of Hideo Sasaki for whom interdisciplinary design began with the landscape architect as the principal planner. An interesting recurring theme in understanding the present challenges facing transit-oriented-design is the distinction between ‘places’ and ‘nodes’. The role of transit as a link between different individual places and the broader region means that transit-oriented-development, unlike other development forms, should clearly execute the dual function as both a ‘node’ within a larger regional or metropolitan system and as a good ‘place’ in its own right. [vi] This notion has to be better understood and implemented. Station areas must provide access to transportation services and in many cases function as regional trip destinations, but the same areas must also serve as trip origins and, ideally, as coherent neighbourhoods that do more than simply serve the station. While this is, on the surface, a relatively simple insight, it proves powerful when it comes to understanding some of the reasons that transit oriented development can yield unsatisfactory outcomes. In the context of a transit-oriented-neighbourhood, a good place can be defined on the basis of measurable functional characteristics such as a choice of transportation modes, housing types, and lifestyles; access to jobs and services; fewer negative impacts of the automobile; and a high degree of satisfaction in residents and visitors. What does ‘ecological’ stand for? The best way to elaborate on Calthorpe’s ‘philosophic ecology’ is to take up the argument that the inimitable James Corner makes in ‘Ecology and Landscape as Agents of Creativity’ in the Thompsen & Steiner edited book Ecological Design and Planning. His take is that ecology, creativity and landscape architecture must be considered in terms beyond those of visual appearance, resource value, habitat structure or instrumentality. [iii] Instead these rather restrictive traditional views might be balanced by an understanding of how the three are metaphorical and ideological representations, cultural images or ‘ideas’. The ideas are not inactive but have profound effect for change in a variety of material, ideological and experiential ways. The heightened significance of ecology in the past decades in social and intellectual affairs have shown a view with an emphasis on temporal interactive processes further reinforced by new scientific findings of nonlinearity and complexities. [iv] But the use of the term has spanned from corporate and media industries as well as by environmentalists, land artists, architects and politicians and has diversified to mean many different things. Although, as Corner points out, ecology has usually been understood as providing a scientific account of natural processes and their interrelationships, “the fact that it also both describes and constructs various ideological positions to be taken with regard to nature points to a greater significance. It is interesting to see the definition of the term from well known ecological architect and the founder of the Ecological Design Institute – Sim Van der Ryn: “Ecological design proposes a marriage of nature and technology, using ecology as the basis for design. The strategies of conservation, regeneration, and stewardship can be applied at all levels of scale to produce revolutionary forms of buildings, landscapes, communities, cities and applied technologies.” Taking the philosophies of Louis Sullivan, Ian McHarg and the principles of ‘genus loci’ and sustainability a step further, EDI and Van der Ryn Architects have created innovative design solutions that link nature, culture and technology to reintegrate the needs of human society within the balance of nature. ‘Ecology’, according to Corner therefore can take multifarious notions and each should be distinguished for clarity. It can be Radical (the different ‘eco’ movements based on hierarchy, moral rights and ethics) Dialectical and Language Ecology (of the “other”, of thought of abstract symbolism) and the Conservationist/Resourcist and Restorative Ecology (such as McHarg’s suitability analysis, other ecologically sensitive techniques and sometimes even ecocentric practices). Each category has its virtues and weaknesses. But like Henri Bergson in Creative Evolution (1944) writes that the role of life is to inject some “indetermination” into matter and a refusal to reduce nature to a physical, “knowable” object, “living memory is the past felt in the actualities of realities, of change.” [x] Such an interrelational view points towards more ‘heterotopic’ kinds of activity and space than singular ‘utopic’ acts. [xi] The very inclusivity and open endedness of heterotopia brings a complex prospect, it also denies singularity, determinacy and hierarchy. As a “structured heterogeneity” such a complex field is neither chaotic nor ordered but free and organic. Ndubisi elaborates that the effectiveness of using information from substantive theories depends on its organization and presentation; when differences exist in the way people from varied disciplines who develop substantive theories understand reality, differing emphasis in the interpretation of the relevant information is likely to occur. 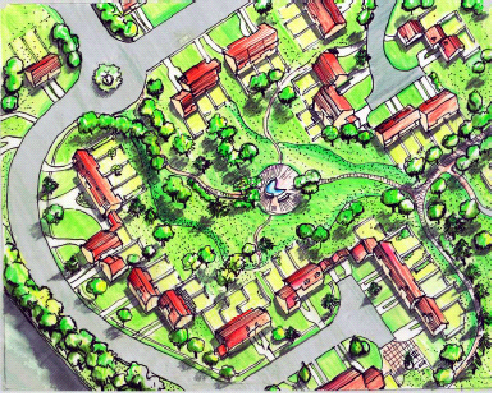 Fig.27 Cluster housing around backyard corridors: An example of neighborhood planning keeping existing green corridors and opting for the cluster layout instead of cookie – cutter templates. Mark Luccarelli in Lewis Mumford and the Ecological region states that Mumford understood the region as a set of environmental relationships. The geographical factors of terrain, climate and soil that establish the condition to which plant and animal life must respond are essential but the region, as Mumford insisted is anything but ideal or abstract. Its existence resides in the “facts” of geography: climate, soil, and terrain constitute the “fundamental basis of existence.” and the region sets the basic material conditions that underlie economic, technical and social development. [xxi] While doing the Wabash River Valley study the inter- disciplinary design team in Philip Lewis’ Tomorrow by Design understood how identifying resource patterns revealed scales of thinking from local to regional. In the broader context of ‘ecology’ of the human habitat which teaches diversity and interdependence Calthorpe reiterates that understanding the qualities and physical characteristics of nature in each place, the regional connectors of nature can unify the multiplicity of neighbourhoods, communities, towns and cities of metropolitan regions. “Preservation and care for a region’s natural ecologies is the fundamental prerequisite of a sustainable and humane urbanism.” As Calthorpe notes, communities historically were embedded in nature as it helped in setting both the unique identity of each place and the limits of the community. The local climate, plants, vistas, harbours and ridgelands that defined the special qualities of each place have now been replaced by smog, concrete paving, receding ecologies and polluted soil and water. But this factual view again has to be balanced with the more ideological ‘inter-connectedness’ of ecological thinking. Solutions grow from place – an intimate knowledge of place, small scale and direct, responsive to local conditions and people, inhabiting without destroying. Make Nature visible – making natural cycles and processes visible, and informing us of our place within nature through effective design. Everyone is a designer – listening to every voice in the design process because as people work together to heal their places they also heal themselves. Neighbourhood transit-oriented-design: Another rendition of community design? The transit neighbourhood is often characterized as an alternative suburban ‘community’ and in truth embodies much of the spirit that defines a ‘good community.’ In the pluralist and multicultural society of North America, for the most part, citizens find the emotive ties of community in the myriad voluntary associations, charities, churches and local neighbourhood groups rather than in nation or place. [xxvii] This is increasingly true in an age of fast-pace living and a landscape of faceless sprawl. It is interesting to note that some of the ideas that today constitute good transit-oriented-design such as rail connections, community parks, open courts and pocket parks, had already found expression more than 100 years back in Frederick Law Olmstead’s proposals for community plans in Georgia and Illinois. Olmsted wanted to join the best aspects of the city and country life by linking the residential suburb with the central city working place by rapid transit – railway or street cars through scenic corridors. He saw residential suburbs in which landscape architects would design residential grounds with numerous “open air apartments” by which domestic activities could be moved outside the home. Pedestrian walkways and riverside parks were part of the picture. The only difference was his large spacious plot sizes as opposed to today’s moderate density TOD proposals. When he designed ‘Riverside’ the community plan outside Chicago, he called it a suburban village, but he was not a romantic. The suburb was not to be a retreat; suburbanites were to enjoy all the refinements of town life. Fig.28 Residential street in Montreal’s ‘Mont-Royal Plateau’ area. Sidewalk cafes in the city’s old neighbourhoods. One the best examples in North America how pedestrian and transit-friendly cities create a much richer living experience. In the book Transit Villages in the 21st century, (1997) authors Micheal Bernick, director of the San Francisco Bay Area Rapid Transit District, and Robert Cervero, professor with the Department of City and Regional Planning at U.C. Berkeley Traffic jams cover many aspects among which one is a defence to an underlying critique by some observers that transit villages are ‘boutique’ design and the choice of residing in them is either due to gentrification or poverty. One of the defences to this ‘boutique’ critique is that transit villages already exist and that they are not only viable as communities but successful in achieving a high level of transit share. To illustrate this point, the authors present findings from visual preference studies that show that North Americans prefer moderate-density mixed-use developments to suburban sprawl (or at least they prefer slides of such developments). They also present case studies of emerging or existing transit villages in the U.S. and abroad. In the Montreal context, selling the idea of higher density neighbourhoods with a sense of community is not difficult at all – firstly due to the shortage of affordable housing and secondly due to the demand for the ‘village’ ambiance. Indeed, one of the hippest and most expensive areas of the city, known as the Plateau Mount Royal has one of the highest building densities and maximum transit usage inNorth America. The preference for the Plateau as one of the most desirable places to own an apartment, unlike the historically affluent Westmount borough, is a growing phenomenon because traditionally it had largely remained a working class neighborhood before writings about its charms in the media and a growing recognition for its human scaled pedestrian friendly design propelled it to become one of the most expensive areas of Montreal to reside in. The North West side where the site for the practicum project is located has high real estate values in spite of its largely banal suburban look. The healthy growth pattern ofMontreal is reflected in its higher downtown property value; but it is of concern when ‘placeless’ suburban houses are also being sold at very high prices. The price of houses are also much higher on the western, more anglophone part of the island even though the design of the more francophone eastern, south central and central areas are more pleasing and full of picturesque lively pedestrian and public places. The planning outside the city’s inner and outer suburban rings is quite a different story. While the people of Quebec take great pride in their unique regional character and identity (of which no proof is required!) the lively and charming character of Montreal, Quebec City and older neighbourhoods in towns like Longueil, Ste-Thérèse etc. are not reflected in many of the newer developments taking place in the suburbs or along freeways. Places like Repentigny (25 minutes driving east of Montreal), Ste. Julie in the south shore, new developments along the Angrignon subway station have a planning not unlike hundreds of north American bedroom communities, with wide treeless roads, bull dozed and flattened sites, rows of single family houses and big box stores like Wal-Mart, Zellers etc. in close proximity. The joie-de-vivre of their city streets and cafés that French-Canadians are so proud of or even the picturesque community sense of the eastern townships are absent. While complaints of this loss of character are many there is little public action taken on it. These new ‘neighbourhoods’ have become not unlike their American clones albeit with French signboards much like the plethora of ‘dubbed’ Hollywood films lining the shelves of the adjoining Blockbuster video store and the children listening to the ‘dubbed’ versions of the latest U.S billboard hits. It is ironic therefore when these children or their parents talk passionately about Quebec’s identity and the protection of the French language while leading ‘dubbed’ American or any other similar western Canadian suburban lives and retaining little of the rich architectural heritage or regional identity that their cities stood for. While one might not debate the pros and cons of the political beliefs shared by many in these neighbourhoods, one can only feel sorry for the loss of character in the design of these neighbourhoods and many like these which are off shooting at an alarming rate both on and off the island. This is not just a provincial problem, but as many critics have written, a continental North American problem. John Sewell, while addressing the Canadian Association of Planning Students National Conference in Winnipeg in 1996 commented that the “journey to where we are today” had been pointed out by the Garden city concept of Ebnezer Howard which resulted in the notion of combining the city with the countryside, Frank Llyod Wright’s Suburban vision of the broadacre city and Le Corbusier’s concentrated high rise solution whose “Canadian example (is) Hwy. # 427 in Toronto heading towards the airport.” While it is true that all three thinkers were idealistic and highly talented in their own rights, when future generations interpreted their visions, their powerful influence was synthesized into a reductionist solution rather than embrace the complexity that should determine the urban regional form. Today’s sprawl, derelict downtowns and environmental degradation has a lot to do with the reductionist approach where a one-solution-fits-all is the norm and essentially the basic problem. And yet in today’s context it is no longer valid to cry over spilt milk or pass the buck around, nor get stuck in a comatose inertia. One almost has to take the attitude of “Deal with it!” and challenge the problem head on to move on in a more constructive way. It is here that the new thinkers in academia and practice who are becoming pioneers of a new branch known as ‘Ecological Urbanism’ will play a pivotal role in shaping our planet’s future. According to Lewis Mumford the purpose of transportation was not only to bring people or goods to places where they were needed but to concentrate the greatest variety of activities and people within a limited area, in order to widen the possibility of choice without making it necessary to travel. “A good transportation system minimizes unnecessary transportation; and in any event, it offers a change of speed and mode to fit a diversity of human purposes” Transportation is a means of facilitating social and economic interaction for people, not an end in itself. In The Highway and the City Mumford writes: “The paradoxical result of this concentration on motorcars is a curbing of freedom of movement, a removal of alternate choices of transportation, the steady reduction of the speed of local travel, and the total defeat of the city itself as a place that offers the maximum possibilities for face-to-face meeting, social cooperation, and transactions of every kind.” In this light it can be argued that a community when linked to the larger region by public transit and when carefully designed brings together more human interaction or a ‘coming together’ than the autocentric subdivision would. It is easy to see why the concept of a transit neighbourhood seems like an appealing option in the models of community design. A well designed transit neighbourhood provides for and emphasizes public space that affords residents with opportunities for face to-face contact while they walk within the neighbourhood. Because of this fact, it encourages personal identification with definable places, and therefore fosters stronger ties within the community. In his book Bowling Alone, social scholar Robert Putnam has documented the breakdown of civil society in America as people become more disconnected from their neighbours, communities, and families. Putnam contends that this fragmentation threatens our health, safety, and even our very democracy. He contends that the fragmentation is caused by several factors, one of which is the usual suspect of urban sprawl, with its emphasis on private living space in fringe areas and travel that is conducted almost exclusively by personal automobile. Furthermore, this fragmentation occurs not only at the community level, but also within households. His body of research indicates that workers who live in sprawl-type neighbourhoods have more travel stress, absenteeism and turnover than workers who live in denser, transit-supported neighbourhoods. TOD, therefore, can strengthen family connections or at least aim to, because workers are more rested after work due to a lower travel related stress load. In his work, Putnam describes the basic, but important, principle that, as people associate with one another in various capacities, whether it be on the sidewalk, at the grocery store, or at the transit stop, they form relationships that can be relied upon to provide for personal needs (e.g., walking the dog, babysitting) and to address broader community problems, thereby sustaining a higher quality of life for everyone. Additionally, according to Putnam, each relationship is an asset, and the accumulation of these assets forms each person’s or communities’ “social capital.” TODs can therefore, promote community building and the development of social capital. Other factors such as personal values, residential turnover, and other demographic variables will also affect social cohesion and community building. In the design of a community comes the aspect of social behaviour and environmental psychology. One has to pay attention to the design and orientation of the buildings themselves where there exists authentic green spaces and corridors (and by this I don’t mean the patch of lawn grass) in their clusters and at the same time brings back the lively character of the street and sidewalks which as so eloquently observed by Jane Jacobs in The Death and Life of Great American Cities serve the use of assimilating children. As she had observed and analysed, simply following the early Garden city concept of providing indoor courts (which serve only younger children) and having blank walls face the street does not work as does the isolated playground and streetscapes without adult eyes not work. At the neighbourhood scale, very often parks and open spaces are pushed into residual spaces and buffer zones between segregated uses. Instead careful planning can put them in more focal and effective locations – as meeting grounds rather than apologetic afterthoughts. Thankfully, Montreal being an excellent city to observe some of the most successful urban public spaces, much can be drawn from the principles that do work with regards to street widths, sidewalks and street frontage and as usual the tried and tested methods in the older city which developed through the culture of the place and work far better than the placeless suburbs off shooting on many sites. A stronger public ritual for colonizing of local communities and city extensions should be adopted which spiritually binds and commits future residents to a sense and image of their future community. An incremental formation of communities should be nurtured and encouraged at modest scale rather than pushed aside as obsolete. Development direction and entrepreneurial nurturing should belong to a multitude of higher risk but locally organized efforts forged into a process. Design concerns are one part of that process and should be coded at a regional level so that evocative notions of rootedness and images become an articulated part of a subdivision planning. Some of our simple enduring rules that tie our places to the past as well as the future are required. Human scale must be the yardstick for all new development. A fine grained pedestrian scale must have equal rating with the automobile (or preferably mass transit). Public life in the form of third places (cafés, pubs and small provision stores) should be zoned in rather than zoned out of residential areas. The mews zone or residential enterprise zone might become a means of mixing work and the variety of emerging lifestyles and family needs.New semi-communities which form primary group affiliation like the cohousing models should be watched carefully as potential ways of regaining group affiliations and easing the pressures on two income families. “….What is missing is the marriage of the man-made landscape with the natural landscape (and by this I don’t mean a lack of street trees or foundation planting). Ecology is the intermediary of many diverse systems, and in our suburbia today, we are mono-cropping – the 30 year mortgage crop” writes William Turnbull Jr. in “Buildings in the Landscape”. He rightly asks: what if we added a natural landscape requirement to our myriad zoning and building regulations? While Canadian projects should search for their own identity instead of looking to the south or across the Atlantic and the Pacific, it is interesting to explore this notion of community, ecology and multidisciplinarity in light of its symbiosis in other places and other times. In his essay ‘Ecology and Community Design: Lessons from Northern European Ecological Communities’ Todd Saunders laments that in North America, architectural and planning theorists, not practitioners, develop most ecology and community design concepts. [xxxix] While these works are important contributors to alternative approaches, they tend to become so theoretical that they get detached from practical concerns. In contrast, Northern Europe supports a long tradition and increasingly expanding practice of ecological community design with a variety of academic and practical research. [xl] In his case studies conducted in the Netherlands, Germany, Sweden and Norway he observed that the communities were much better aware of resource management, waste water treatment, the benefits of mass transit and car pooling and environmental stewardship than their American suburban counterparts. Topics of ecology were not abstract notions but directly connected to the decision making process in the design, management and construction of projects. In the northern European ecological communities explored, the dominant form was multi family and cooperative housing. The large lot single family house was largely viewed an anti-ecological. The higher densities and cluster forms reduced sprawl, infrastructure costs, car-dependency and increased bicycle, pedestrian and public transit use. Tighter housing arrangements also left more land for community gardening and children’s play areas and for more natural treatment of wastewater and storm water. Another important commonality amongst the communities studied was the easy access to public transportation. The car was viewed more as a tool of choice rather than necessity. Car sharing was common and organized. In some cases, residents like those of Fraenweg in Kassel, Germany parked their cars in a carport near the neighbourhood entrance making it an auto-free community. In other communities such as in Ecolonia in the Netherlands the roads were designed to control and slow traffic through speed bumps and narrower widths. Many of these northern ecological communities also included natural areas within their boundaries, protecting them during construction. The presence of these natural areas – included not excluded from the buildings – allowed people to observe, experience and appreciate the cyclical processes of nature and prevented the loss of sensual perceptions and identifications. [xli] There is much to be learnt from these examples including the integrated team approach to these community designs. Moving from one end of the overtly ‘ecology dominant’ community of Scandinavia to the overtly ‘human dominant’ community of South East Asia, it is worthwhile to make some observations. In India, for instance, in spite of the near total absence of urban ecological communities and a constant increase of pollution and environmental degradation, there is no dearth of the human element of an elevated ‘sense of community.’ In spite of its extreme socio-economic, cultural, racial and geographical diversities, whether it is in urban centres, in rural villages or isolated settlements in remote parts of pristine mountains and forests, there is an overt sense of community spirit and bonding – of a ‘unity in diversity’. On closer inspection it becomes evident that this is not just a socio-cultural phenomenon, but is largely induced as a support-system for mutual help due to an unreliable infrastructure and frequent delays and inefficiencies in government-run public services. In North America one can lay the blame on the design of the suburbs for a number of social issues, but at the same time realize that efficient infrastructure and prompt public services lessen the need to rely on one’s neighbours in daily life. The coming together of community in everyday life therefore becomes an act of choice, design and optional need for interaction, not a necessity as a guard against emergencies, which is the case in the Indian subcontinent. This ‘integral approach’ to architectural and planning philosophy is reflected in the science of Vastu Shastra known as the ancient East Indian ‘architectural science of time and space harmonizing humanity and nature.’ [xlv] The original author of the text known as the father of ancient Indian architecture was Vishwakarma, also called Maya. The science was based on the concept of space as a dynamic element relating to cosmic and yogic vibrations. Its main intent was to create buildings which harmonized with nature and followed elaborate instructions of how climate and plant species should be part of the design and the system of ‘mandala’ or modular diagrams relating to mathematical equations. The ‘mandala’ came from the ‘Vastu-Purush mandala’ or literally ‘architecture-man-module.’ The science combined sculpture, mathematics, material science, herbology and philosophy. The courtyard as a thermal insulator corresponded to zero or ‘shunya’ meaning empty space. Astronomy and especially mathematics was combined with spirituality and every building type followed equations relating to their length, breadth and height according to sun and wind orientations and the surrounding landscape. The decimal system and quadratic equations for determining form was very important. These had been invented hundreds of years earlier with the science of Vastu – several hundred centuries before Arab invaders in India introduced it to the West. [xlvi] Remnants of these integrated designs are still found in many parts of Southern India, and in Bali where it spread through Hindu kings and in the far East where it was adopted through Buddhism, although in most of Northern India, subsequent Islamic invasions destroyed much of this building science till its multidisciplinary theory has been revived again in recent times by architecture theoreticians and historians. It seems, therefore, that the essential multi-disciplinarity in the very definition of the ‘architect’ in its origins in both Eastern and Western cultures has undergone immense and obvious changes through time. In practice it has undergone a process of reductionism and specialization over the last several centuries. And interestingly, time and again, in the domain of theory it has tried to reassert this multi-disciplinary interweaving – be it Mumford or Calthorpe. But so much justification is needed to reiterate this simple notion of interconnecting the network of different disciplines that more time is wasted in the effort itself. It is sadly ironic then that a new term ‘network architect’ which has nothing to do with building nor landscape architecture but rather with internet electronics management steals our profession’s title but captures its lost basic requirement of making the interconnections. In his 1999 CIP conference paper The City and its Region or The Region and its City Ian Wight brings up the need for dialectic and network as opposed to dichotomy and hierarchy. He writes that we live in a “highly pluralistic and multicultural society, replete with interrelationships that demand constant mediation while offering little expectation of easy resolution” such as global/local, corporate/community and nature/culture[xlix] which is why this ‘network’ becomes even more essential. Quoting Leonie Sanderbuck’s idea of rethinking city-region planning through a dialectic perspective, Wight suggests the “crossing back and forth, of blurring boundaries, of deconstructing (‘community’, ‘the state’) and reconstructing new possibilities.” This entails a shift in not just redefining the notion of ‘region’ with the qualities of fusion, flux, blurred edges and boundless possibilities[l] but also ‘re-placing’ the profession as planner/mediator/ orchestrator at the heart of the territory/function dialectic. Echoing the same concern in the chapter Solutions Grow from Place from Syn Van der Ryn and Stuart Cowen’s book Ecological Design it is reiterated how tried and tested design adaptations to place that arose out of climate and culture have been abandoned in favour of standardized modern templates “designed to be conveniently dropped into any situation and any location.” These templates, requiring extravagant amounts of energy and materials, destroy landscapes wholesale and also erode local and regional differences to the extent that places and cultures are being bulldozed into a planetary geography of nowhere. [liii] This is so true in the context of the selected site where the surveyor working for the developer in the initial proposal had produced exactly such a ‘bulldozed’ plan which proposed cutting off all the mature vegetation on the site, destroying the adjoining marsh and the old field stone walls present on the site and putting a ‘template’ of roads and single family homes. Their explanation was that they did not have any existing data of site conditions and vegetation other than the adjoining road and rail track! Going back to the Ryn and Cowen the task of ecological design is to recreate solutions adapted to place. “Both the lessons of indigenous design and sophisticated new ecological technologies are critical to this task.” Patrick Geddes’ coining of ‘Eutopia’ (good place) and his comparisons to Thomas Moore’s Utopia (derived from the Greek ‘no place’) summed up a fundamental tenet of the this imperative: that it makes sense to design with the forms and cultural and ecological processes already present in a location rather than to force an idealized, preconceived plan upon a site. [liv] Only when culture and ecology become an integral part of design thinking can Eutopia be assured. Unfortunately the trend for conscious design to perpetuate the conditions of no place is as strong as the present day forces that are shaping cities and the regional landscape. Transit-oriented-design cannot be and should not be a utopian vision although it can try its best to be a eutopic ‘good place.’ It must operate within the constraints of the market and realistic expectations of behavior and lifestyle patterns. [lv] However, the market and lifestyle patterns can and do change as a result of both policy choices and socio-cultural trends. More importantly as mentioned in section A, site and location specificity should mark its design to function to its full potential and not just a standard set of guidelines. Community design must be multi-disciplinary as simple solutions come from combining problems rather than segregating them. In my own years of experience I have found this to be all too true. When an appraisal of constraints and expectations imposed by each interest group or each branch is done together and layers are created, one can look into the problem holistically. Instead what often happens in practice is that the design process occurs in a linear fashion rather than in a multi-dimensional way. Our professionals, registration boards and often even senior peers stress on specialization, segregation and engage in a battle of egos. Specialized groups go through a problem separately and want a series of changes at each stage – narrowly focusing on only its own discipline and blocking out the others. At the end it leads to an incongruous solution. Instead if all the issues of the different disciplines were out on the table at the same time in the initial stage, there are better chances at collecting exhaustive data input right from the start, better brainstorming and negotiations and a more balanced or harmonious solution can be reached. Soaring down from the poetry of theory to the prose of reality, it can be said that today the struggles facing the implementation of transit-oriented-development is precisely due to the delay in accepting that only through increasing interconnections, interdependence and a symbiotic relation can a proper synthesis be achieved and success guaranteed. If we think of continuum or hybrids – of spaces in between- instead of opposing dualities, we view the ideas in relationships and not inherently value one term over another. [lviii] Transit-oriented-design seeks to align transit with a community’s vision for how it wants to grow by creating mixed-use, denser, walkable transit villages with a ‘sense of place’. The base for a framework of diverse networks can be found through the substantive and procedural theories of a holistic ecology and its ‘integral’ nature. This in turn informs the real inter-relationships within the design of a community linked to the larger region through transit and accepts the organicist idea of unity in a multi-disciplinary process. [xxxi] Wight, Ian. “The City and its Region or the Region and its City?,” Plan Canada, (January –February 1999) 24. [xlix] Wight, Ian. “The City and its Region or the Region and its City?,” (Plan Canada, January –February 1999) 24.